I got a bunch of ATtiny13 AVR microcontroller chips because I tought it would be fun to see what you can do with a tiny 8 pin microcontroller. The thought first popped into my mind when I looked at a project for creating motor controller for an electric spinning wheel. The project used the same chip as in an arduino with an arduino bootloader. The ATmega328 is a lot more expensive than a ATtiny13. You can get a tiny for around 20 Kr at e.g. electrokit in sweden. Lots of projects such as motor controllers with buttons or a dial for controlling speed does not need anything more than a tiny13, and a small program. My first problem however hooking up the circuit below to program one of my tiny13s, is that it is easy to connect the cables to the programmer wrong. 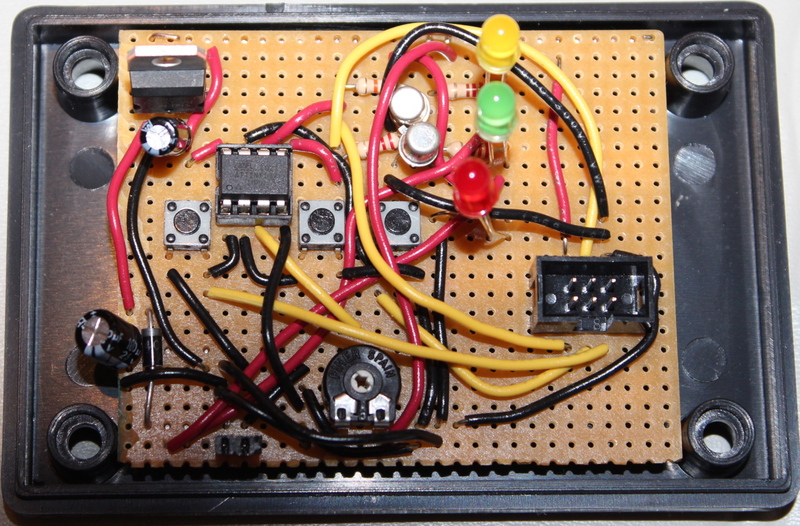 Development board for AVR ATtiny13 microcontroller on breadboard, connected to a AVR-ISP500 programmer from Olimex. Pin 2 and 7 are connected to push buttons, which will pull the pins LOW when pushed (will connect to GND). Pin 6 and 5 drive a yellow and green LED through 2 transistors. The two transistors and 22K Ohm resistors are there to avoid interfering with the programmer, since it uses those pins for MISO and MOSI. The example above is not too bad because I used colored wires with one female and one male end. 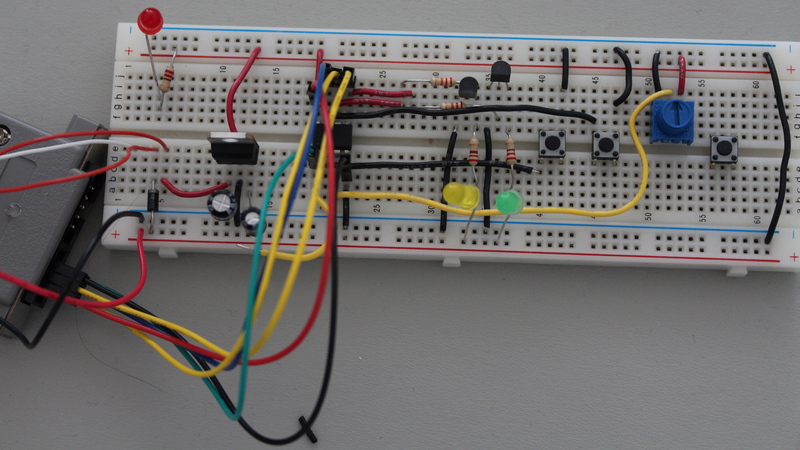 Thus I could connect the female end directly to the output of the programmer and the male end into the breadboard. But if you have to connect into the connector of a ISP6 cable then it is easy to get the pin numbering wrong. So that is why I build the above curcuit first on a breadboard, tested it and then built it on the prototype board below. Pin 2 and 7 are connected to push buttons, which will pull the pins LOW when pushed (will connect to GND). Pin 6 and 5 drive a yellow and green LED through two 2N2222 transistors. Potentiometer is connected to pin 3. Red LED indicates that our LM7805 voltage regulator is delivering power. On the bottom right there is a ISP6 connector for in system programming. It has a ISP6 connector (black 2x3 pins). With this there is only one way to connect the cable from your programmer, so it is very quick to connect your 8 pin AVR microcontroller to a programmer. A lot of devboards contains the bare minimum of components. I wanted to be able to test most of my ideas and programs directly on my development board without having the move the chip to another circuit to do actual work. 2 outputs connected to a green and yellow LED. These are connect to pins which can do PWM, since I will need that for motor controller programs. 2 digital inputs connected to push buttons. Assume pullup resistor is enabled. 1 analog input connected to a potentiometer. 10uF, 100uF capacitor handling 25V. 10K potentiometer. Two 2N2222 transistors. 3 push buttons (one for reset not shown). 3 regular LEDs as shown. 1 switch for power. LM7805 voltage regulator (+5V out). Restors as shown. If figured I would to projects with blinking LEDs, dimmers or motor controllers. All that will require PWM. Hence pin 6 and 5 were selected for output. In the design it is worth nothing that the outputs of the AVR chip do not power the green and yellow LED directly. The reason for that is that pin 6 and 5 are used for in system programming, and are thus connected to our programmer. Connecting LEDs directly to these same pins as used by the programmer could interfere with its operation. ATMELs datasheets(page 6) says you should put in a series resistor between the load and the AVR. 10K would be a good value. I put in 22K and a transistor so very little current or voltage drop will happen to drive the LEDs. I can program the AVR without any external power because the AVR-ISP500 programmer I use delivers power to the AVR through pin 2 of ISP6 connector. With the transistors I am also able to program it while external power is connected and the circuit is running. This makes development a lot faster, because I do not need to unplug anything to test the circuit, or plug in anythin to transfer an updated version of my program. Here is a very simple program I ran on it to make one of the LEDs blink. I will not explain the program here, because it is just something for you to try, to make sure it works. ;set prescaler to divide clock freq by 1024.